Cats face constipation and its never pleasant. Although it usually goes unnoticed, constipation in cats is not only uncomfortable but can lead to even more serious medical problems. If you notice your cat whining at their litter box or yowling in discomfort, you should consult your vet and find the best cat food for constipation! The easiest way to find the right cat food for constipation is to identify what makes cats constipated and how their diet affects their digestive system. You’ll want to completely rule out dry food as is a well-known source of dehydration. Most cats get water from their food. In the wild, a cat may not drink water on a regular basis at all. Dry food typically has too little moisture, and this can lead to constipation. If your cat is already experiencing constipation, then you’ll want to switch them to a wet cat food option right away. There’s a lot going on internally when they eat kibble. So, when you switch your cat over to a wet cat food pate or chunky diet, the digestion process is much simpler. Some fur parents prefer to take matters into their own hands and add water or broth in with their cat’s dry food. Unfortunately adding water isn’t enough. If you do add water or broth to your cat’s dry food, you’ll want to heat the food up and mix it well to ensure that the kibble has absorbed the water. Some ingredients will help cats get back on their regular schedule, and many cat food options have them available! You’ll want to search for pumpkin puree and aloe vera which are the go-to natural additives for fiber. But, processed additives can include fiber powder and slippery elm bark powder. As you are looking for high-fiber ingredients, you’ll also want to avoid recipes that are mostly animal-based proteins. Although many recipes have turkey, chicken or even pork as the first ingredient, you’ll want to see some vegetable following closely afterward. A diet that is high-protein will help them maintain lean muscle and high levels of activity. But, when you have too much protein and not enough fiber you naturally end up with constipation. You cat will thank you for looking for recipes that use pumpkin, sweet potato, and peas. Cats are known to gain a bit of weight through their lives, and we’ve certainly promoted a culture that glorifies the fat cat. But, obese or overweight cat’s will often suffer from constipation. An overweight cat will overeat and slow down their digestive system. Additionally, overweight cats will eat things that aren’t necessarily good for them. An outdoor fat cat might creep over to the neighbor’s house to chow down on some kibble left out before returning home for their food. To help prevent constipation in overweight cat’s you’ll need to end free-feeding (or leaving a food dish out all day) and your cat should be eating wet food until you see the constipation problem resolve itself. 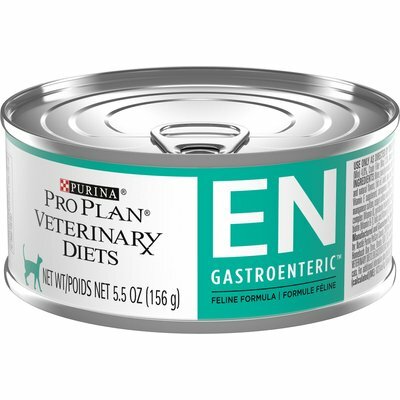 Purina Pro Plan Veterinary Diets formula is meant for cats who have a variety of intestinal or digestive problems. But, the formula itself is also helpful to cats who have constipation. The oat fiber is an excellent ingredient that can balance their digestive system without overloading the cat with fiber. The use of turkey, liver, fish oil and oat fiber provides a steady balance between protein and fiber. Additionally, the moisture in this food is about 78% which for many cats is the only solution for constipation. The recipe relies on by-products and liver which are known to lead to other problems with digestion. Because by-products are often internal organs that require more digestive energy than simple white chicken meat, your cat may go longer without a bowel movement. If you know that your cat has a history of stomach or digestive problems, you’ll want to ask your vet about Purina Veterinary Diets EN Gastroenteric Formula. You can discuss your options in high fat, low fiber solution for your cat! The low fiber is what genuinely sets this option apart from the other contenders for best cat food for constipation. Although the fiber percentage is low, the oat fiber breaks down quickly and goes right to work! 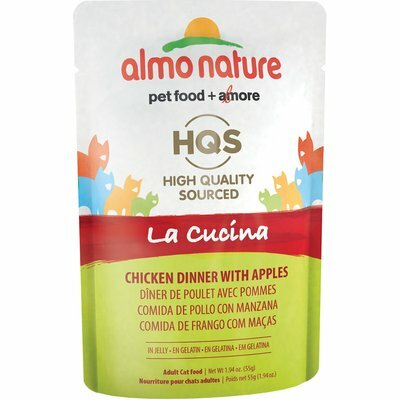 Another low fiber option for constipation, Almo Nature La Cucina looks for options that are natural to help your cat out of their jam. They use apples which are naturally high in fiber phytonutrients as well as other minerals and vitamins that are valuable to their health. The lack of grains, however, may be the solution to your cat’s problem. When we start to look at grain-free food options, you’ll see that the protein, is higher, while the fat is lower. Carbs are slow burning sugars which contribute to weight gain and many digestive problems. Eliminating unnecessary carbs can be the relief your cat needs. We didn’t like that although the food is in such small pouches. Although these are ideal for small cats, a large cat can only rely on these as a supplement to an already healthy diet. There’s not much more than you can do with this food option if your cat is over 10 pounds. If you have a small cat, these could serve as a steady part of their diet while they get over this stretch of constipation. The additives which fill in some of the nutritional gaps can help them build up more energy and digest with greater ease. Overall, if you’re looking for a way to reduce the carb intake as an effort to promote healthy digestion, the Almo Nature La Cucina Chicken recipe is a fantastic option! Initially made for cats with stomach sensitivities, and allergies this limited ingredient wet cat food option is an excellent option for any pet parent. The single animal protein source will keep digestion easy and should help to make constipation ease up as well. The grain-free recipe will also help with digestion and clearing up constipation as they won’t have to work so hard to process carbohydrates. Pumpkin is the third ingredient listed for this recipe, and that’s outstanding! The fiber is at 1% which is no surprise because the moisture is so high. While the pumpkin delivers all the fiber that your cat will need, the moisture is a bonus that will help the constipation problem as well. There’s nothing to dislike about this formula. There are a lot of oils present here which will also help with constipation but could lead to weight gain if you’re not careful about how much you’re feeding your fur baby. Overall, Natural Balance LID Limited Ingredient Diets Chicken and Pumpkin Formula is one of the best choices for helping your cat through constipation. The formula doesn’t require a veterinary prescription, although you should consult your vet if you’re noticing your cat going through long periods of constipation. The chicken and chicken broth ingredients are surely top quality. When you look at the brand, Natural Balance takes great pride in keeping their quality outstanding. AvoDerm is an amazing brand that relies on the natural diets of animals to develop their recipes. This wet cat food consists of sardines sitting in sardine broth with potato start and avocado oil. The oils and potato will help break up the proteins. But, the single source protein is a great way to help the digestive system by giving it a little break. We love that AvoDerm turned to sardines. Although whitefish and the mysterious fishmeal are regular ingredients in wet cat food, the small sardine is a reasonable possibility in a cat’s natural diet. There are very few food options for cats that bring this solution to the food dish. We don’t like that the potato starch was used in the consommé to thicken the broth rather than just allowing the vegetable to be present in the recipe. Technically his recipe has no vegetables which can make digestion even more difficult! If your cat doesn’t regularly suffer from constipation, this formula could be a great way to ease their discomfort as a sidestep to their normal diet. The high percentage of moisture is fantastic and might be the only solution to constipation that your cat needs. 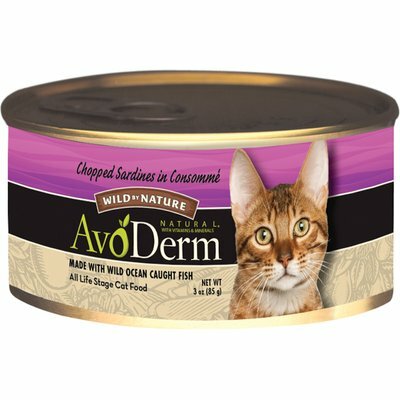 Overall, the single source protein of sardines makes AvoDerm a worth possibility for the best cat food for constipation. The sardines are chopped for irregular sizes which should encourage your cat to chew even though it’s wet food. Additionally, sardines are known to treat urinary health which can be an underlying cause of constipation. Go! Is a new brand on the pet food scene and they’re making waves by blending high-quality ingredients with supplements to fill in nutritional gaps? This recipe uses duck, turkey, dried egg, potato, sweet potato, carrots, and apples. We know that many of these ingredients are good for us, but they can be the solution to your cat’s constipation! We love the diverse use of vegetables and fruits. During times of constipation, your cat might intentionally hold off on releasing their bowels because they fear the strain that will come with the attempt. But, with ingredients such as apples, sweet potatoes and carrots they’ll feel the need to go when the time is right. The only ingredient to call into question here is the dried egg. Although dried egg is regularly used as a protein boost in cat food is can counteract the levels of moisture we’re counting on to relieve constipation. This formula is a great food choice which can stand in for any diet. The blend of vegetables and fruit will help relieve their constipation that your cat is suffering. But, the use of a protein boost from the dried egg has left the amount of moisture slightly lackluster. As a result, the moisture content in this recipe is much lower at 78% compared to the competition’s moisture levels staying at about 82%. It’s important to remember that if your cat regularly has kibble, this moisture level is a giant leap for him. 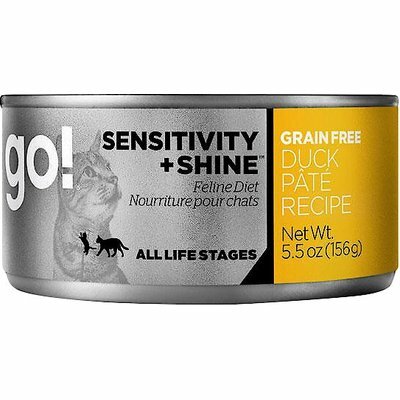 What’s more is that the oils that are naturally present in duck will help keep your cat’s digestive system moving as well! Made for cats that have problems with digestion, including constipation, Natural Balance LID Limited Ingredient Diets Chicken and Pumpkin Formula Shreds is the go-to solution for cats that are having problems in the litter box. The grain-free, wet food option will help ensure that your cat is staying well-hydrated while also getting the protein, fiber, and fat that they need. The high-quality ingredients are easy for your fur baby to digest, and the pumpkin will help naturally boost their digestive system to get things going again. If you started noticing your cat having small, hard bowel movements that came with some straining or yowling, you’ll want to give this food a try. 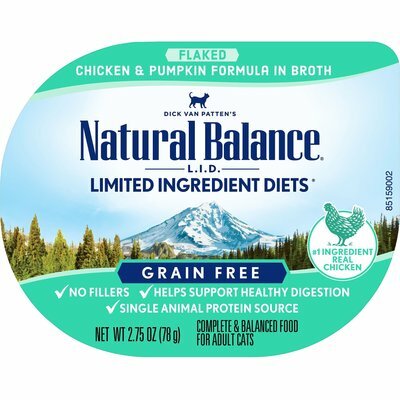 The best cat food for constipation is a limited ingredient chicken and pumpkin recipe from Natural Balance!